The OnePlus 6T McLaren Edition will make its global debut on December 11 in London with an Indian event following on December 12 and finally a Chinese launch on December 14. 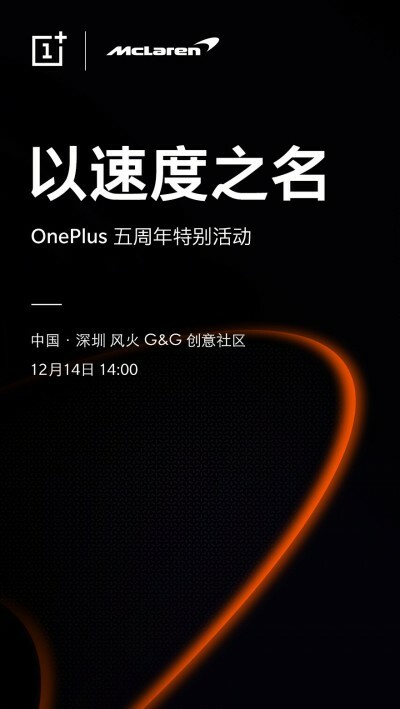 The latter date was made official by OnePlus themselves through Weibo. The 6T McLaren Edition will be shown at a special event in Shenzhen. There’s still no word on the specifics of the OnePlus 6T McLaren Edition but there’s a good chance that it will have 10GB of RAM and 256GB of on-board storage. If we go by previous OnePlus partnerships (like the OnePlus 3T Colette, OnePlus 5 JCC+, OnePlus 5T Star Wars, and OnePlus 6 Avengers Infinity War) we can expect a new paint job, some exclusive accessories in the retail package and perhaps a McLaren theme on the phone.